Playing with some scraps I have created this crazy piece. It has been laying among many orphan blocks till last week. In my country we have an exhibition content and I want to create a modern quilt to participate in. The jury is very famous Fiber artist Caron Ann Waugh and Madame Samm from Sew we quilt. 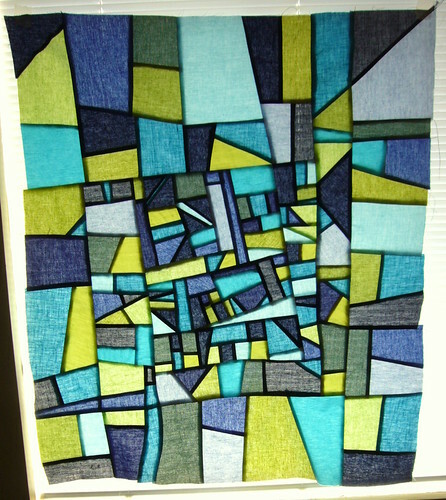 As a winner ofthe last contest - mini quilt Eco Patchwork I have to made something real stunning. A very interesting idea came into my head. I intend using this crazy piece as a corner or centre and adding more pieces to have an illusion of a broken window. I love creating buildings and windows. Probably because I like interior design too much. Piecing, adding, sewing, ironing, wandering and again. I have use my new design wall. It is great to have one. Don't know why I haven't use till now. Love the final result too much and took a picture in front of my window. The quilting turned out easier then I expect. 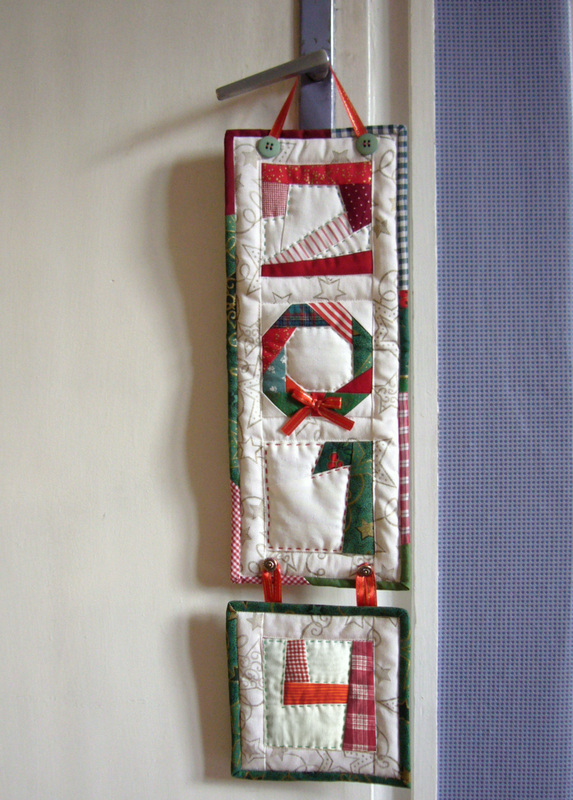 When quilted previous mini wall hanging I discovered that tiny pieces look better without quilting. I mean smaller than one inch. Some of them are half inch in fact. And leave the central part as it is. Round it I stitch straight lines with walking foot and at upper site I have made an arc. In binding added color stripes accent and here it is. Waiting for the contest crossing finger! I have started these project in 2012. Then added the number three for 2013. 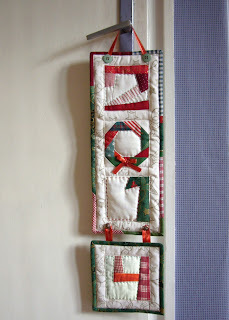 Now in hot summer I was asked by some quilters to update my pattern New Year wall hanging. Is it time for New years preparations already? In fact it is very easy and fast to update - I have sewn the number 4 only. Now it is in my ETSY shop. If you have the pattern from last year - add only the missing numbers 4-9 from here. The blocks for these pillow covers were made in May. The cushions were ready in June. The pictures are here now. The process from sewing to displaying took me more time than I expect. I wish I have more opportunity to show my works faster. Some years ago I have visited n exhibition of student graduated the National art school. And I was impressed by a poster with the poem of Jacques Prevert. I have learned it by heart. 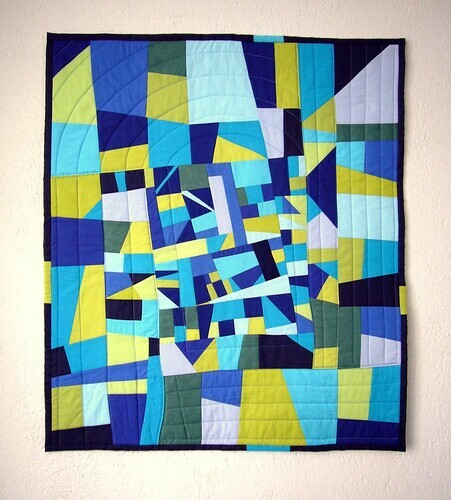 As I have more self-reliance in my patchwork and quilt skills I decided to create this quilt. 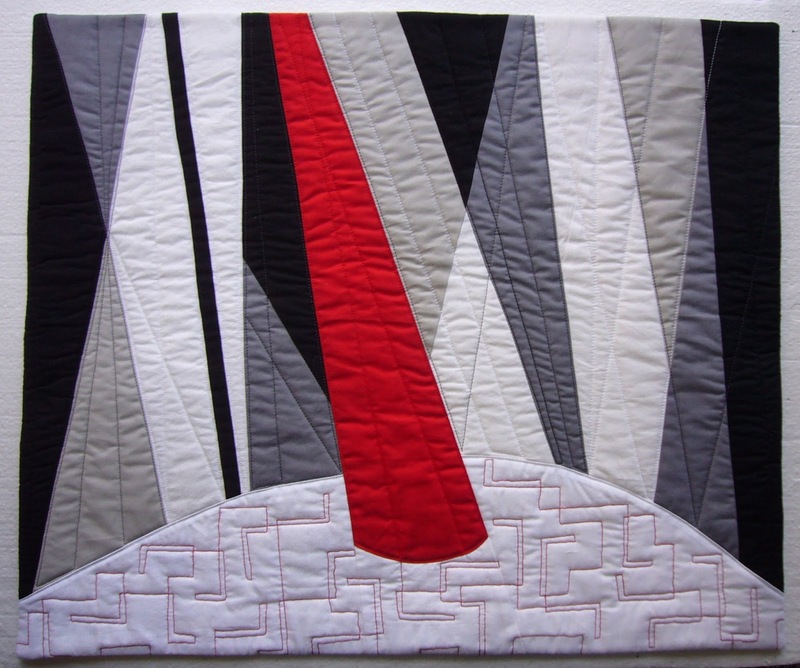 I have no doubt about quilting. Straight lines for the spotlights and background. Do you know how to make a move with the horse when playing chess? This was decision for quilting the carousel (manege) . Instead of simple label on the back I put printed text of the poem in three languages. P.S. The size is 18 x 22 inches. 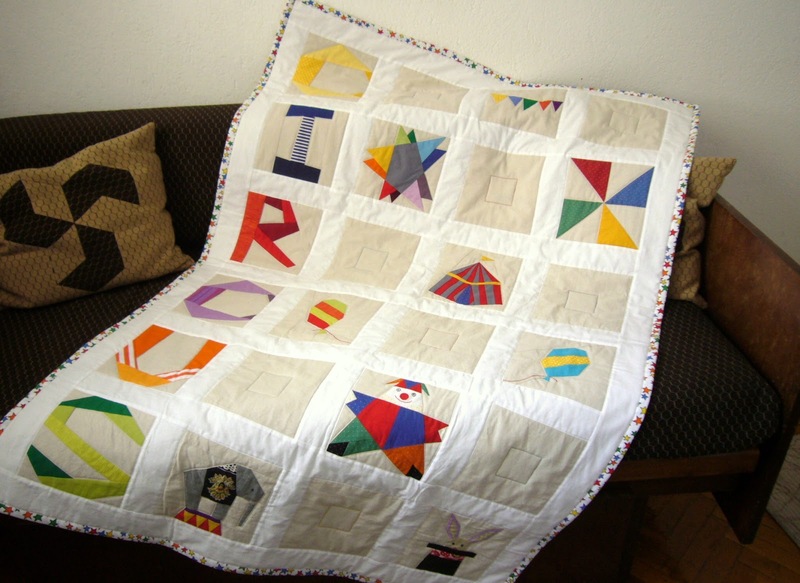 You remember my Circus quilt, don't you? When I have shown it to the Patchwork group my friends advised me to add some quilting on the blank squares. In fact I had been wandering about this , but have no final idea I preffer. I tried to add stars, pinwheels etc., but without result. So now, some months later, I decide to quilt squares. Two inch squares different thread's colors. I haven't erasable pencil and had to think out how to stitch them equal. 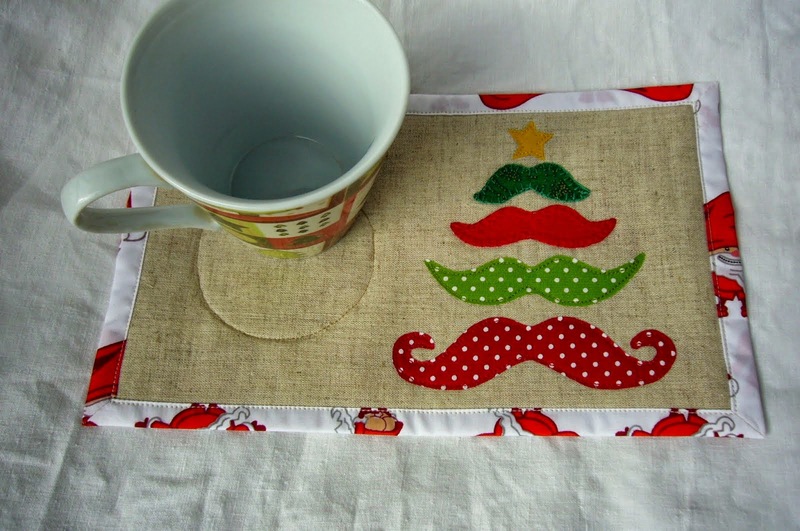 Cut a 2 inches square and iron on the desired position. Measure with a ruler. Stitch along the perimeter using walking foot or FMQ. I had to change 9 times bobbins and upper thread. I think the quilt looks better this time.